LDTP Overview The Linux Desktop Testing Project (LDTP) is a set of opensource testing tools that uses accessibility libraries to trigger applications' user interface widgets. LDTP is based on Assistive technology. 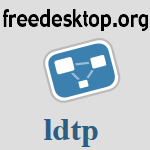 The LDTP can generate an "AppMap" by finding out what widgets applications use. The framework can also record test cases by watching what a user clicks on. The LDTP framework then uses this "AppMap" and the recorded test cases to test applications. Using this tool, the GUI functionality of an application can be tested in Linux, Solaris, FreeBSD and embedded environment Linux GUI Application testing. LDTP can test any accessibility-enabled GNOME application, Mozilla, OpenOffice, any Swing-based Java application and should be able to test Qt 4.0-based KDE 4 applications in the future if a KDE press release is correct. The LDTP is released under the GPL and LGPL. The GNU/Linux Desktop (GUI Application) Testing Project (GNU LDTP) aims to produce a high quality test automation framework with cutting-edge tools that can be used to test and improve the GNU/Linux or Solaris desktops. It uses the Accessibility libraries to discover through the application's user interface. The framework also has tools to record test-cases based on user actions in an application. GNU LDTP is a GNU/Linux / Unix GUI application testing tool. It runs on GNU/Linux, Solaris, FreeBSD and Embedded environments.